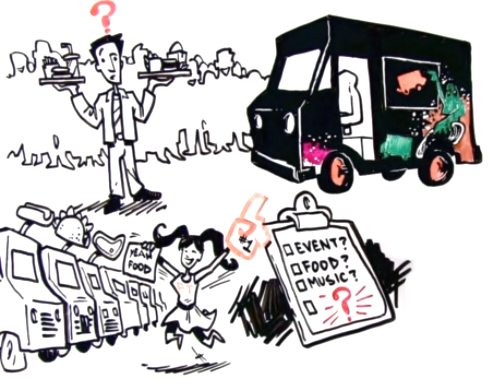 Organizing a food truck rally is no easy feat! Between chasing down a food truck (or a dozen trucks!) to attend your event, ensuring they are properly licensed and insured, hoping they will show up on the day of, and that they have the capabilities to serve the number of people you have in the time allotted, it’s a task with many moving parts. How well versed are we in these difficulties? We’ve encountered new ones every time we’ve done an event! With several years of experience in hosting food truck caterings and events in Tampa Bay, we have handled just about every eventuality that may occur during your event - which means we also have a big head start on developing a work-around solution! Part of our process begins with vetting the food trucks themselves. When you look to hire a food truck it can be a shot in the dark. Are they going to meet your expectations and be reliable? Is their food quality consistent? Can they deliver a great customer experience? Are they able to turn tickets quickly enough? We can recommend the appropriate number of trucks to fit your needs, and who will deliver the services you require. The trucks we work with have been determined to be reliable partners through experience, and know our standards and procedures. We can also help to ensure the trucks have the information they need prior to arriving, in order to be well prepared for your event. This does not mean that every truck we work with is infallible, but our history with the trucks, our knowledge of their strengths and weakness, and the vetting process ensures a much higher rate of success. If you’re looking to have a fun and seamless experience, look to us to handle the hiring of food trucks at your next event. Contact us today at 813-802-9119 or fill out our booking form here, and a local expert will contact you shortly to discuss your event in more detail.